If you are considering building a new extension or refurbishing an old ﬂat roof it’s very important that you consider insulating your new roof to comply with the latest building regulations and the need to increase energy efficiency. Diamond Fibreglass can advise you on the advantages and beneﬁts of both solutions to help you decide which system is the best for you. By insulating your roof using a ‘warm roof’ technique, you not only dramatically increase your energy efficiency but keep your house warm in the winter and cool in the summer! 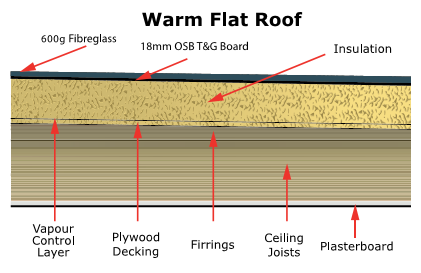 Traditionally, flat roofs are formed of single timber board or “deck” with a waterproof covering fitted to the top of the board. This outdated design is somewhat archaic and harks back to a time when insulation of all types was simply an afterthought. 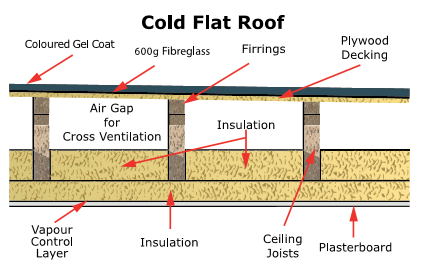 A cold flat roof does include some insulation by way of mineral wool. This wool is packed into the joists and rafters and a clear gap of 5cm is left between the insulation and the timber board to allow condensation to escape this is to prevent the condensation making contact with the boarding or deck. Cold deck insulation needs to be externally ventilated to prevent rotting. Water simply must be prevented from collecting on the timber deck. Although essential the need for this venting, commonly known as draught venting, system has one unwanted effect; it is incredibly inefficient and as such the heat lost is considerable. Aesthetically this venting system can be quite offensive as these vents will be quite apparent and may even jut out from the surface of the roof. Now there is a better form of insulation available for your flat roof. This system is called warm deck insulation and eradicates the condensation and venting issues associated with the cold deck system. The layer of insulation is essentially placed outside of the roof. This, in turn, means the deck is sealed off and effectively placing the deck inside making it completely free from the dangers of condensation and the associated rotting commonplace with cold roof insulation. The insulation material itself is polyisocyanurate foam which is finished with a specialist foil fitted to either side. Put simply the concept behind this design is ingenious as it provides over twice the heat retention when compared to the old style thermal mineral wool. Not only will this type of warm deck insulation keep you warmer it is also far kinder to both your pocket and the environment. This type of insulation will keep you warm in the Winter and cool in the Summer and at the same time it will reduce your fuel bills. Please contact Diamond Fibreglass if you would like to discuss your requirements with us.